Below are the official 2018 Hockomock League Boys Soccer All Stars, selected by the coaches in the league. 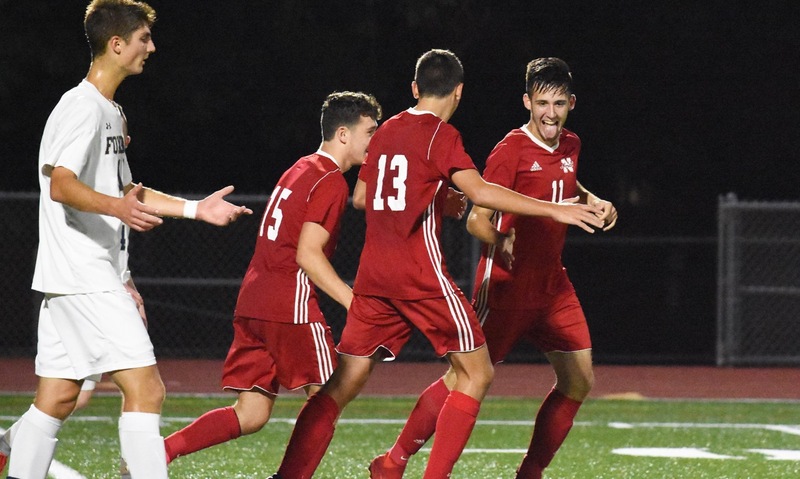 Sharon, 0 @ North Attleboro, 2 – Final – North Attleboro scored a pair of goals in the last 10 minutes of the first half to secure a win in its final regular season game. Dylan Corrigan put things in motion for the opener, playing a ball through to Matt Conley, who crossed it to Joe Hilf in the 32nd minute. Five minutes later, James Sales converted a corner kick from Joey Coscarella. Kyle Briere recorded his 12th shutout of the season. Milford, 3 @ Stoughton, 0 – Final – Milford junior Walisson de Oliveira scored a pair of goals and had an assist, tying the program record for career points. Oliveira made it 1-0 in the first half off a feed from Lucas Da Silva, a lead the Hawks took into halftime. de Oliveira set up Tiago Carvalho for a 2-0 lead, and then scored his 22nd goal of the year (from Leo Coelho), putting him in a tie for the golden boot. Carter Gerome made 22 saves in net for Stoughton. Milford @ Sharon – Postponed to Thursday, 11/1. NORTH ATTLEBORO, Mass. – When the calendar turns to October, teams start keeping an eye on their rivals in the league standings and two points become even more important. North Attleboro started the night just three points back of Davenport-leading Canton, which was playing second place Milford, so the Rocketeers understood the importance of two points on Thursday night at Beaupre Field. North dominated the first half, scoring twice, and then held off a Foxboro charge after the break, keeping the Warriors off the board until the final two minutes of the game, to walk away with a 2-1 victory that moves within one of the Bulldogs and Hawks in the league standings. The hosts took that to heart on Thursday and gave an early warning to the Foxboro defense when Joe Hilf played Matt Conley in behind the Foxboro left back just two minutes into the game. There was contact, but not enough for the official to give the penalty. Hilf almost opened the scoring a minute later but dragged his shot from the edge of the box just wide. Both teams settled into their styles after that, with North loading the midfield and looking for the quick outlet in transition and the Warriors trying to play out of the back. It was the Rocketeers that controlled the action in the opening half, limiting Foxboro to only a couple of weak shots on goal and constantly putting pressure on the visitors’ back line. Hilf sparked North into the lead after 19 minutes. He made a long run down the far sideline, rode a sliding challenge from Brian Gardner, and got free on the right side of the box. His cut back into Conley was blocked by a couple of Warriors but the ball popped out to Alex Pfeffer in the middle and he side-footed his shot into the empty net. Just four minutes later and the Rocketeers doubled the lead. This time it was Matt Mordini that got free down the right channel. The junior cut it back into middle for Hilf, who was left free on the edge of the box, and he hit it first time into the far corner. Foxboro’s best look of the opening half fell to Shane Vandenboom, who hit the outside side-netting with a curling effort from 18 yards. It was about all the North defense gave up in the opening half, as center backs Evan Rosenberg and Gavin O’Malley kept the Warriors out of dangerous areas. In the 29th minute, North could have put the game away when James Sales’ free kick from 28 yards came back off the crossbar. Hilf almost sealed the win in the 35th minute when he nodded a long clearance by right back James Bush past his marker and got a free run on goal, but his shot went over the bar. Foxboro needed to make some changes at halftime and came out with more intensity, but Hilf nearly hit the Warriors on the counter when his clever dummy beat his marker, but Foxboro keeper Nick Penders was out quick to smother it. The visitors started to get a foothold going forward, particularly through midfielder Joe Cusack, who kept popping up in between the lines and finding pockets of space where he could dictate play. He had Foxboro’s first good look that went just wide. Chances started to flow for the Warriors. A throw-in from the left found Vandenboom, who laid it off for Daniel Basler, but his shot from 20 yards went high. A minute later, a long free kick from Daniel Lowey found Dylan Barreira’s head in the box and he nodded it down to Nic Beigel but the shot was saved. Barreira also forced North keeper Kyle Briere into a save with a 28-yard free kick. Briere made his best stop just a few minutes later to deny Cusack at full stretch at the midway point of the half. It kept Foxboro off the board when the Warriors were clearly on top in the game. Cusack had a free kick from just outside of the box that was saved comfortably and Foxboro nearly fashioned an opener with five minutes left when Matt Garcia played the ball through to Barreira, whose header found Vandenboom but he couldn’t keep his shot down. North had one more chance with a late free kick that was played straight across the box by Joey Coscarella, but Pfeffer couldn’t put his shot on frame when he met it at the far post. Foxboro did get one to make for an interesting final two minutes. Beigel’s free kick from the left corner of the box went through a sea of bodies in front, and possibly got a touch off a North defender, before sneaking in the far side. But, it turned out to be only a consolation for the Warriors. North Attleboro (4-1-6, 4-1-5) will next face Kelley-Rex leader Mansfield on Wednesday, while Foxboro (3-5-1, 3-5-1) will be back in action on Saturday at Bishop Feehan. FOXBORO, Mass. 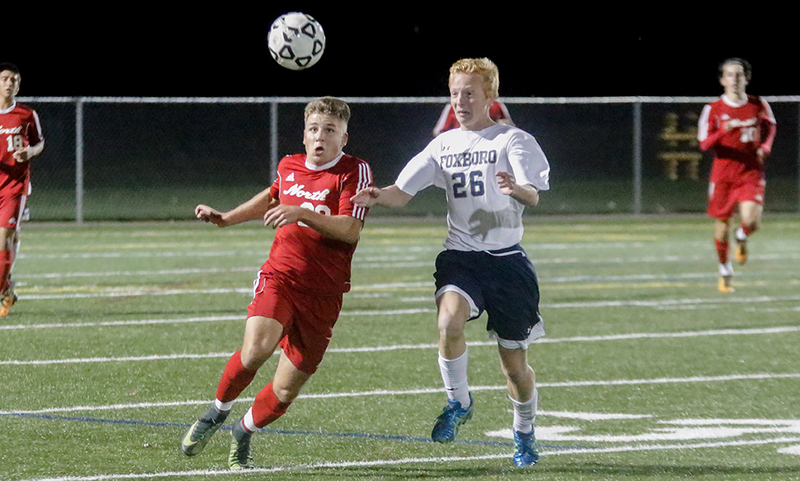 – With the division title picture already wrapped up, Thursday night’s showdown between Foxboro and North Attleboro wasn’t about league standings, but instead a preview of what’s to come in the postseason. The two teams traded a pair of second half goals, finishing level, 1-1, at Sam Berns Community Field. In years past, North and Foxboro wouldn’t cross paths once the regular season ended. But the new alignments implemented this season have both Big Red and the Warriors in the Division 2 South tournament. Foxboro was fresh off a 1-1 draw on Tuesday against Canton. The Warriors had nearly a dozen scoring chances go begging in the second half against the Bulldogs. The Warriors picked up right where they left off on Tuesday, even attacking the same goal. But unfortunately, it was more of the same. Foxboro continued to build offense and register chances, but failed to find the back of the net in the opening 40 minutes. Just over five minutes in, sophomore Dylan Barreira’s flick put senior Matt Rongione in behind on the right flank, but his low service towards the back post went without a recipient and rolled just wide. In the 15th minute, Ryan Kelley got in behind the defense and went alone at the keeper, but North’s Brendan Matracia came charging out of his net to make the sliding stop. North’s first chance came just before the half hour mark. Senior Ryan Pasquel’s free kick just over half was batted around at the edge of the area before Zach Matracia got a shot off, but it went well over the bar. Foxboro had back-to-back chances in the 31st and 32nd minutes. First, Barreira’s corner kick was met by Mike Moses’ header near the penalty spot and then left back Will Regan launched a shot from distance, but Matracia made comfortable saves on both bids. “They dominated us in the first half, we had really nothing going on,” Burgess said. “I thought we had a better run in the second half, we decided to kind of sit and counter, which is our play usually. We noticed they were only defending with really four guys and I thought if we could get on the counter a few times we could create some opportunities, and we did. North’s first chance on the counter came in the 55th minute when outside midfielder Josh Rodriguez sprinted onto possession near the top of the box. Rodriguez cut back to create some space but his shot was partially blocked and Foxboro keeper Bobby Harrison came up with the stop on the bounce. Just a minute later, the Rocketeers had a shout for a penalty when sophomore James Sales played Jeff Gale into the the area, but Ryan Kelley’s tackle got just enough of the ball to allow for an easy stop by Harrison. Big Red finally broke through in the 67th minute after earning a free kick close to the corner on the left flank. Noah Barney dished a low service into the area that was touched by Zach Matracia back to Sales right in front for the easy tap in and a 1-0 lead. Foxboro nearly responded immediately in the 68th minute when Beigel and Kelly combined atop the area, the former ripping a low shot that clanked off the left post and right back into the grasp of Matracia. But Foxboro continued to apply the pressure and broke through in the 71st minute. Once again, Beigel and Kelley combined, sending Beigel into the area. But before the junior could unleash a shot, North’s Andrew Fontaine came through with a great tackle. The ball rolled right to junior Hussein Kafel and he tucked his shot in at the back post to bring the Warriors level. “We just really didn’t get a lot of our offense going,” Burgess said. “We tried to possess but they are very physical and that kind of takes you out of your game and I they got into our heads a little bit. Every time we went into a challenge, we started looking for them and instead of watching for the ball, we’re looking for the Foxboro kid. Foxboro finishes the season at 10-4-4 overall, and 8-4-4 in league play. Seeds for the tournament will be released on Wednesday. North Attleboro boys soccer finishes its league record at 9-1-6 and its first-ever Davenport division title, which it clinched with a win on the road at Milford on Tuesday. The Rocketeers (10-1-6 overall) will wrap up its season at home in a non-league clash with Attleboro in the annual Leach and Garner Cup.